Should Investors Try to Beat the Market? Do This Instead. One of the top goals of many investors and money managers is to beat the market. This is typically defined as achieving better returns than the S&P 500. Afterall, when you can simply invest in an S&P 500 index fund with a 0.05% expense fee per year, the higher expenses of actively managed funds require some sort of justification. Will they beat the market? Will they match the market but with less volatility? They need to earn their keep somehow. The numbers get worse over 15-year periods; 92-95% of them fail to beat the market over that longer period of time. And these are trained professionals, with CFAs or MBAs and tons of support staff doing research for them. Despite all of that, most of them still can’t do it. More specifically, active funds as a statistical group tend to outperform during bear markets, and underperform during bull markets. Investment professionals as a group are decent at preserving money with all sorts of financial tools and strategies, but aren’t very good at knowing when to let off the brakes and let their holdings soar during bull markets. As a result, most of them underperform over the course of a business cycle. 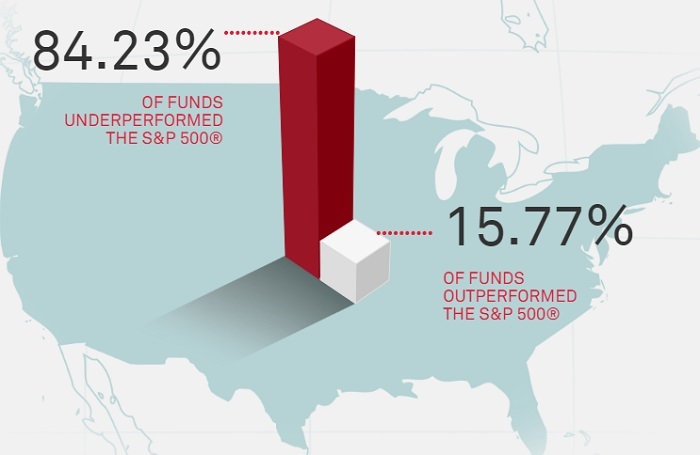 That’s 2.6% in average annual returns for investors, compared to 7.2% returns for the S&P 500. And most of the tiny returns they make are eaten by inflation. The reason the average investor does so poorly is that they tend to make too many portfolio changes too late. After markets have already fallen during a recession, they get scared and sell. Then they miss out on the recovery, and when stocks are high again, they get excited and buy. They fully participate in the market downturns while missing a large part of the market upturns. So, the average investor does terribly, and professionals on average do okay but still underperform. What is there to do? Because the chances of any money manager or household investor beating the market are low, it’s perhaps not the best thing for most people to focus on. So many investors want to know “how to beat the market“, when the real question to ask is, “how can I build the most wealth?” At least, enough wealth to reach your goals. Even the world’s best investors only beat the market by a few percentage points per year over multiple decades. Figuring out how to save more money and increase your average monthly contribution to your portfolio will go a lot further towards reaching your financial goals than figuring out how to boost your average returns by a percent or two. That being said, it’s important not to derail your returns by falling for the common investor mistakes, like buying high and selling low, paying very high fees for underperforming active funds, or investing far too conservatively and not having much equity exposure ever. However, once you avoid the major pitfalls, it’s really about how much you invest rather than precisely what your rate of return is. Therefore, a good thing to figure out is what excites you. What makes you invest more money? I love dividend stocks, including safe high yield dividend stocks. Specifically, companies and partnerships that have a 10+ year record of increasing their dividends through bull and bear markets alike. There’s just something about building a collection of growing dividend streams that gets me excited. There are many things I don’t like to do myself. I don’t ever work on my own car, and I’m not very handy for doing maintenance around the house, for example. I’d rather pay professionals for those areas. If my car makes a squeaking noise or if I have water under my sink, I call a mechanic or a plumber rather than try to fix it myself. But other things interest me, and I like to dive down to the details. I buy individual parts and build my own computers, for example. So I know the ins-and-outs of how my PC works from the inside and can tailor it precisely to my own needs. I just can’t get myself to buy pre-made computers anymore, like from Dell or HP. For my computers, I know the motherboard, the CPU, the RAM, the storage device, the cooling system, the graphics card, and exactly why I picked each of them specifically. I love how my computers run compared to all pre-built ones I’ve ever had before. And I buy individual dividend stocks, knowing what their price-to-earnings, dividend yield, dividend growth rate, return on invested capital (ROIC), and other metrics are. I know the management teams, what their strategies are, and how long they’ve been with the company. I know many of the risks they might face, and what their opportunities are. During times like this, when the market is somewhat highly-valued, I just can’t get excited about index funds. Throwing money into a pool of thousands of companies just feels “meh”. It’s so tied to global economic performance, and there are so many variables involved. Sure, my primary retirement account filled with index funds is automatic, and so I put more money in every 2 weeks and I recommend you do the same. But I don’t push myself to add more, beyond what is automatic. Instead, what pushes me to add more to my other investment accounts is when there’s an interesting investment opportunity that I want more exposure to. There’s an undervalued dividend growth stock I want to buy, to add to my collection or increase my exposure to if I already own it. My individual stock portfolio has indeed modestly outperformed my index stock portfolio, but only because I’ve been willing to concentrate my holdings into a number of high-conviction picks. The real benefit of individual dividend stock investing, instead, is that I’ve simply saved and invested more than I otherwise would have if I were not excited about what I’m investing in. A combination of a reasonably high income, a high savings rate, and a healthy rate of return has brought me out of poverty where I started to a point where I have much more wealth than is typical for my age. For me, investing in dividend stocks leads me to invest more. What makes you invest more? Individual investors and personal financial advisers don’t have many advantages over active fund managers. They have teams of researchers, complex models or algorithms, and exclusive information. But you do have one big advantage. Freedom. Active managers have to worry about their clients losing faith with them. Even the top tier ones that actually do beat the market. If they are down for a year, impatient investors start asking what’s going on, and start pulling money out to invest elsewhere. There’s always someone looking over their shoulder, asking questions, being short-sighted. And this contributes to what is called career risk. Career risk is when financial professionals make decisions based on their own careers rather than what should actually give the best results. That’s what State Street Corp.’s Boston-based Center for Applied Research found as part of a larger study about the factors that drive institutional investment decisions. The majority of the 200 investors interviewed — including endowments, foundations, pensions and sovereign wealth funds — say that the largest determinant in their decision-making process is career risk. For example, a money manager might make an investment decision based on what will retain the most clients, rather than strictly what will make the best returns. Or an analyst might give a safer stock idea to her boss rather than give the more unusual pick she actually thinks is better, for fear of looking stupid. Historically the best investors in the world, like Warren Buffet, beat the market by zigging when others are zagging, and zagging when others are zigging. They buy what is cheap, what is out of favor. They are contrarians. But many active managers are closet indexers. They buy investments that are hot right now, and don’t deviate so much from the index they benchmark against, but still charge higher fees than index funds in order to pay themselves. This even happens to top managers, like Peter Lynch. The Efficient Market Hypothesis states that the market is so liquid and well-analyzed, that all market prices already have all available information factored in, and it’s therefore not possible to reliably beat the market. Any people that do must be lucky, happening to fall on the end of the bell curve of luck. The market is too efficient for even shrewd investors to purposely beat it. This has been debunked a number of ways, and yet still holds partially true, based on how statistically unlikely it is to beat the market. What’s most accurate to say is that the market is quite efficient, but not 100% efficient. And some areas are more efficient than others. More importantly, it is efficiently balancing multiple goals, that often contradict. Investors can use this to their advantage. Then you would know to sell now, right? That’s the obvious thing to do. The stock is going to lose half its value over the next 9 months. That would be a clear buy, right? If you buy now, you’ll more than double your money in about two years. Of course, if you look closely, those charts are for the same stock. The first one is over the next 9 months, while the second one is over the next 26 months. But depending on how far out you could see into the future, you would have reached very different conclusions about whether it’s a buy or a sell. In a way, both are right. It’s a sell for the short term, but a buy for the long term. 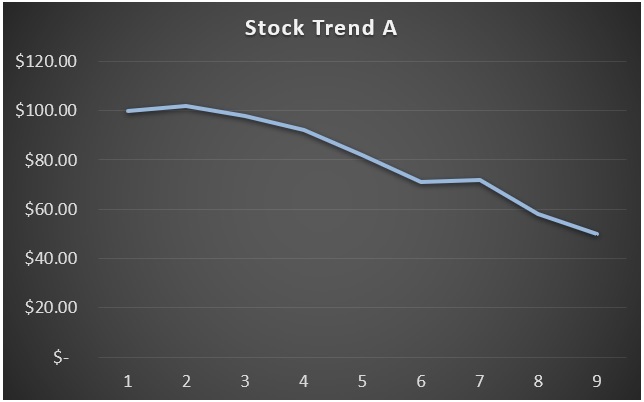 Nobody can see into the future, but the millions of participants in “the market” use a variety of methods to determine whether a stock will go up or down in the short or long term. 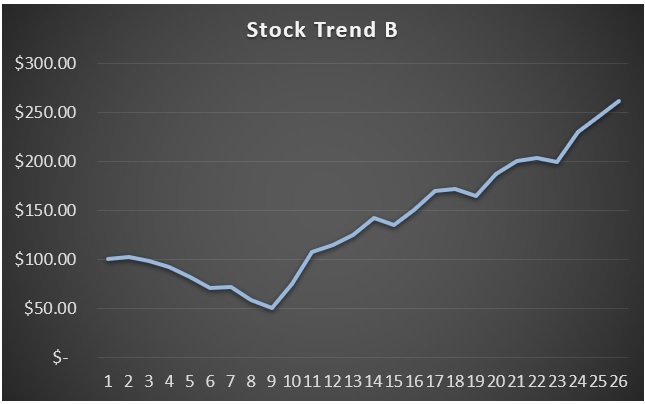 For the short term, technical analysis, price trends, quarterly earnings reports, and other factors tend to drive stock prices, and much of it is based on algorithms these days. For the long term, valuation levels, 5-or-10-year performance results, macroeconomic conditions, investing mega-trends, and business plans determine how well a stock does. The mostly efficient market has to balance both the long term and the short term information when determining the current price of a stock, and heavily favors the short term. It can’t fully optimize for both short term and long term information at the same time. It’ll always be a combination of both. That means if you focus exclusively on the long-term, you’re not really competing with the rest of the market. You’re playing a different game. The vast majority of coverage for any given stock is short-term focused. Analysts mostly give 1-year price targets, and analysts change jobs and change what companies they cover often. Algorithms focus seconds, minutes, days, or weeks ahead. Active fund managers want to have good quarterly and annual reports for their investors/clients. The number of market participants focusing on 5-year results or longer is small. Individual investors have a rare advantage here; nobody is looking over your shoulder asking or complaining about short-term results. You have no career risk. You have no clients to keep happy on a quarterly or yearly basis. Other than perhaps your spouse, you’re the only one keeping track of your portfolio. Using your freedom to focus on long-term results, either with your index portfolio or with your individual stock portfolio, is one of the only ways for individual investors to “beat the market”. But even then, it’s not guaranteed. While beating the market is a noble goal, and there are some methods to have a decent shot of doing it, the best thing for most investors to focus on is investing more money into the market and staying diversified. As long as you avoid major investing pitfalls, how much you invest is more important than precisely what your rate of return is. Keep fees low, don’t trade too much, don’t overestimate your ability to time the market, don’t panic and sell, and you should do fine. 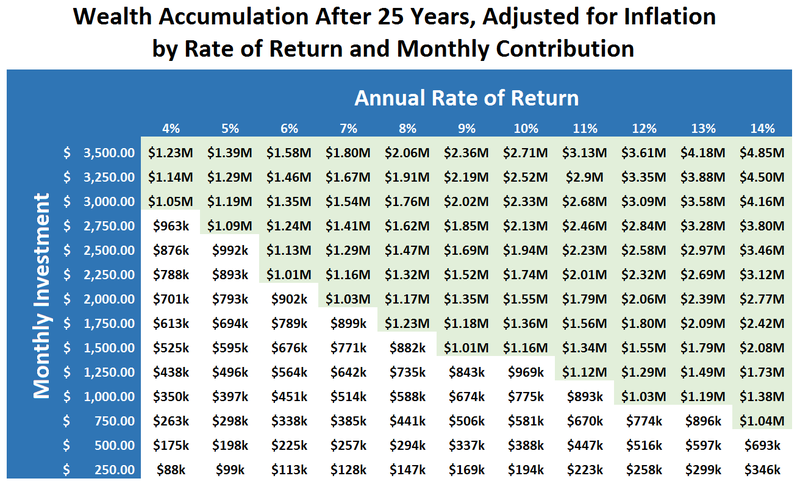 A good method to invest more into index funds, assuming you have a 401(k) or other retirement plan, is to crank up that contribution percentage from your paycheck. The more money you can add to your retirement account before you get your hands on it, the more you’ll invest. Apart from that, when post-tax adding money to your IRA or taxable account, figure out what interests you, what pushes you to invest more. For me, it’s blue chip dividend stocks. I like buying ever-growing streams of dividends, to build more and more passive income and total returns. The combination of index funds and dividend stocks is my sweet spot for building wealth. Figure out what makes you invest more, and more importantly, what makes you stay the course even in the face of recessions and other market corrections.